In Allergic Rhinitis the inside of your nose gets swollen and inflamed. As a result, you may experience nasal allergy symptoms, such as sneezing, congestion (stuffy nose), runny and itchy nose. In addition, conditions such as Asthma, Nasal Polyps (small growth of tissues in the nasal cavity), Sinusitis (infection of sinuses), Otitis Media (infection of middle ear) and difficulty in breathing may also be associated with rhinitis. 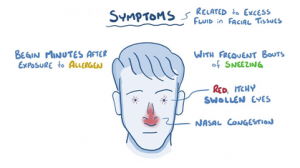 If you sneeze and have a runny nose or nasal congestion only at certain times of the year, you probably have seasonal allergic rhinitis (your triggers are outdoor substance such as: tree, weed or grass pollens, outdoor mold and spores), but if you suffer from nasal allergy symptoms all year long you probably have perennial allergic rhinitis.